Ken Baskin talking about big history and complexity theory. 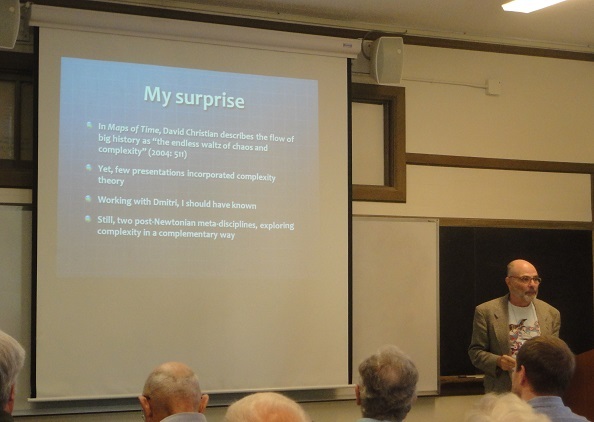 Ken Baskin, author of the forthcoming The Axial Ages of World History: Lessons for the 21st Century, said that big history and complexity theory are “post-Newtonian disciplines that complement each other.” His subsequent exposition made a real impression to this end. He used the now-familiar concepts of complexity — complex adaptive systems (CAS), non-linearity, and attractors, strange and otherwise — to give an exposition of big history periodization. He presented historical changes as being “thick” — that is to say, not as brief transitional periods, but as extended transitional periods that led to even longer-term states of relative stability. According to his periodization, the hunter-gatherer era was stable, and was followed by the disruption of the agricultural revolution; this eventually issued in a stable “pre-axial” age, which was in turn disrupted by the Axial Age. The Axial Age transition lasted for several hundred years but gave way to somewhat stable post-Axial societies, and this in turn has been disrupted by a second axial age. According to Baskin, we have been in this second axial transition since about 1500 and have not yet settled down into a new, stable social regime. 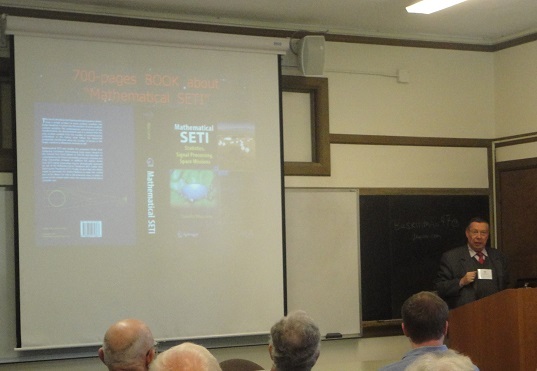 Claudio Maccone on big history and SETI. Claudio Maccone is an Italian SETI astronomer who has written a range of technical books, including Mathematical SETI: Statistics, Signal Processing, Space Missions and Deep Space Flight and Communications: Exploiting the Sun as a Gravitational Lens. His presentation was nothing less than phenomenal. My response is partly due to the fact that he addressed many of my interests. Before the IBHA conference a friend asked me what I would have talked about if I had given a presentation. I said that I would have talked about big history in relation to astrobiology, and specifically that I would like to point out the similarities between the emergent complexity schema of big history to the implicit levels of complexity in the Drake equation. This is exactly what Maccone did, and he did so brilliantly, with equations and data to back up his argument. Also, Maccone spoke like a professor giving a lecture, with an effortless mastery of his subject. Maccone said that, for him, big history was simply an extension of the Drake equation — the Drake equation goes back some ten million years or so, and by adding some additional terms to the beginning of the Drake equation we can expand it to comprise the whole 13.7 billion years of cosmic history. I think that this was one of the best concise statements of big history that I heard at the entire conference, notwithstanding its deviation from most of the other definitions offered. The Drake equation is a theoretical framework that is limited only by the imagination of the researcher in revising its terms and expression. And Maccone has taken it much further yet. j.actaastro.2010.05.003). His work is the closest thing that I have seen to being a mathematical model of civilization. All I can say is: get all his books and papers and study them carefully. It will be worth the effort. 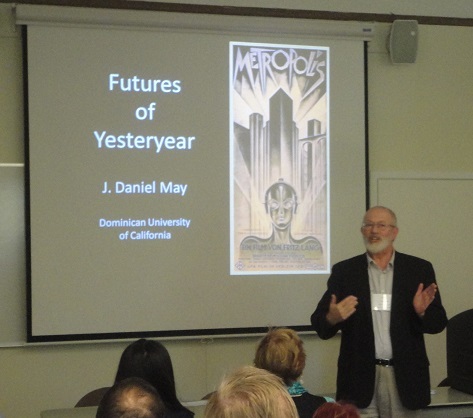 J. Daniel May looking at past futurism through science fiction films. The session started out with J. Daniel May reviewing past visions of the future by a discussion of twentieth century science fiction films, including Metropolis, Forbidden Planet, Lost in Space, Star Trek, and 2001. I have seen all these films and television programs, and, as was evident by the discussion following the talk, many others had as well, citing arcane details from the films in their comments. Joseph Voros discussing disciplined societies. Joseph Voros then presented “On the transition to ‘Threshold 9’: examining the implications of ‘sustainability’ for human civilization, using the lens of big history.” The present big history schematization of the past that is most common (but not universal, as evidenced by this conference) recognizes eight thresholds of emergent complexity. This immediately suggests the question of what the next threshold of emergent complexity will be, which would be the ninth threshold, thus making the “ninth threshold” a kind of cipher among big historians and a framework for discussing the future in the context of big history. 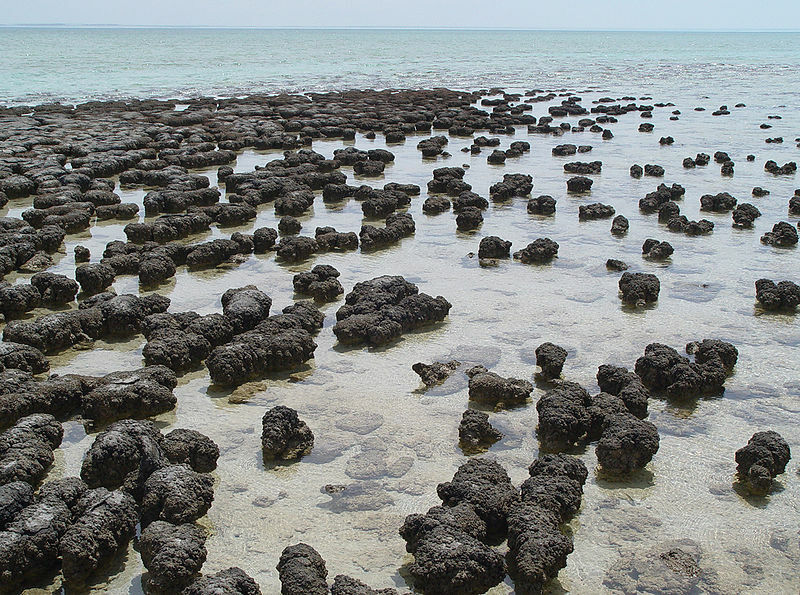 Given that the current threshold of emergent complexity is fossil-fueled civilization (what I call industrial-technological civilization), and given that fossil fuels are finite, an obvious projection for the future concerns the nature of a post-fossil-fuel civilization. Voros claimed that all scenarios for the future fall into four categories: 1) continuation, 2) collapse (which is also called “descent”), 3) disciplined society (presumably what Bostrom would call “flawed realization”), and 4) transformational society, in which the transformation might be technological or spiritual. 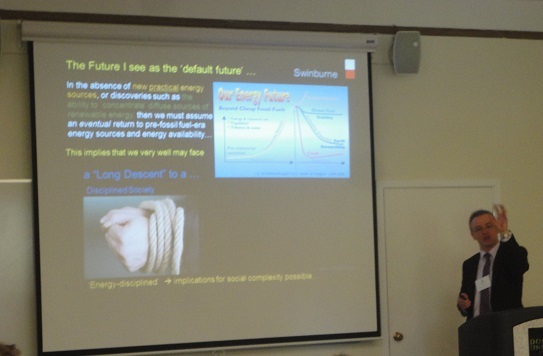 Since Voros was focused on post-fossil-fuel civilization, his talk was throughout related to “peak oil” concerns, though at a much more sophisticated level. He noted the the debate over “peak oil” is almost irrelevant from a big history perspective, because whether oil runs out now or later doesn’t alter the fact that it will run out being a finite resource renewable only over a period of time much greater than the time horizon of civilization. With this energy focus, he proposed that one of the forms of a “disciplined society” that could come about would be that of an “energy disciplined society.” Of the transformational possibilities he outlined four scenarios: 1) energy bonanza, 2) spiritual awakening, 3) brain/mind upload, and 4) childhood’s end. After Voros, Cadell Last of the Global Brain Institute presented “The Future of Big History: High Intelligence to Developmental Singularity.” He began by announcing his “heretical” view that cultural evolution can be predicted. His subsequent talk revealed additional heresies without further trigger warnings. Last spoke of a coming era of cultural evolution in which the unit of selection is the idea (I was happy that he used “idea” instead of “meme”), and that this future would largely be determined by “idea flows” — presumably analogous to the “energy flows” of Eric Chaisson that have played such a large role in this conference, as well as the gene flows of biological evolution. (“Idea flows” may be understood as a contemporary reformulation of “idea diffusion.”) This era of cultural evolution will differ from biological evolution in that the idea flows, unlike gene flow in biological evolution, is not individual (it is cultural) and is not blind (conscious agents can plan ahead). Last gave a wonderfully intuitive presentation of his ideas, and though it was the sort of thing that futurists recognize as familiar, I suspect much of what he said would strike the average listener as something akin to moral horror. Last said that, in the present world, biological and linguistic codes are in competition with each other, and gave the example familiar to everyone of having to make the choice whether to invest time and effort into biological descendants or cultural descendants. Scarcity of our personal resources means that we are likely to focus on one or the other. Finally, biological evolution will cease and all energies will be poured into cultural evolution. At this time, we will be free from the “tyranny of biology,” which requires that we engage in non-voluntary activities. 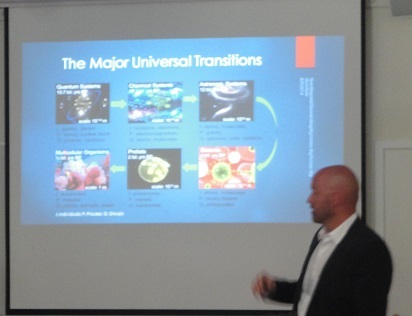 Camelo Castillo discussed major transitions in big history. For the final sessions divided into separate rooms I attended panel 44, “Reconceptualizations of Big History.” I came to this session primarily to hear to Camelo Castillo speak on “Mind as a Major Transition in big History.” Castillo, the author of Origins of Mind: A History of Systems, critiqued previous periodizations of big history, noting that they conflate changes in structure and changes in function. He then went on to define major transitions as, “transitions from individuals to groups that utilize novel processes to maintain novel structures.” With this definition, he went back to the literature and produced a periodization of six major transitions in big history. Not yet finished, he hypothesized that by looking for mind in the brain we are looking in the wrong place. Since all early major transitions involved both structures and processes, and from individuals to groups, that we should be looking for mind in social groups of human beings. The brain, he allowed, was implicated in the development of human social life, but social life is not reducible to the brain, and mind should be sought in theories of social intelligence. Castillo’s work is quite rigorous and he defends it well, but I asked myself why we should not have different kinds of transitions at different stages of history and development, especially given that the kind of entities involved in the transition may be fundamentally distinct. Just as new or distinctive orders of existence require new or distinctive metrics for their measurement, so too new or distinctive orders of existence may come into being or pass out of being according to a transition specific to that kind of existent. 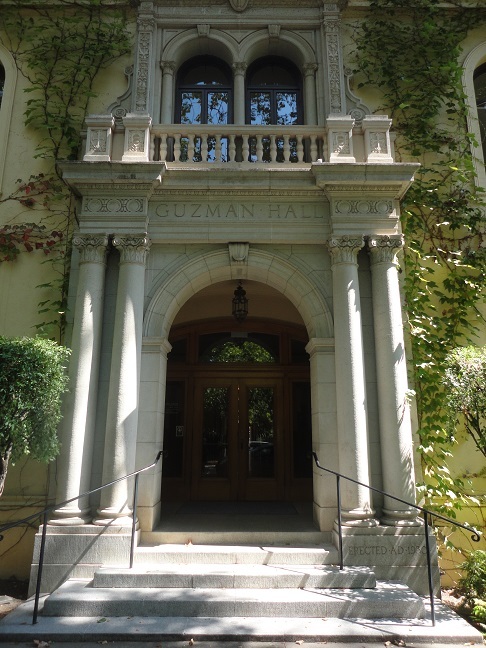 Guzman Hall, where most of the 2014 IBHA events took place. After the individual session were finished, there was a series of plenary sessions. There was a presentation of Chronozoom, Fred Spier presented “The Future of Big History,” and finally there was a panel discussion entirely devoted to questions and answers, with Walter Alvarez, Craig Benjamin, Cynthia Brown, David Christian, Fred Spier, and Joseph Voros fielding the questions. After the intellectual intensity of the sessions, it was not a surprise that these plenary sessions came to be mostly about funding, outreach, teaching, and the practical infrastructure of scholarship. And with that the conference was declared to be closed. In this, the Kepler mission has been wildly successful. But in order to get to the point at which our civilization could conceive, design, build, and operate the Kepler mission we had to pass through thousands of years of development, and before our civilization developed to its current state of technological prowess, it took terrestrial biology billions of years of development to arrive at organisms capable of creating a civilization that could develop to this level. Contrast the experience of Kepler’s exoplanet search with the experience of SETI, the search for extraterrestrial intelligence. What did not happen as soon as we began searching for SETI signals? We did not immediately begin hearing a whole range of intelligent extraterrestrial signals, which would have been a result parallel to the immediate successes of the exoplanet search (immediate, that is, in the technological zone of proximal development). Both Kepler and SETI are searches of the sky. The Kepler mission gave nearly immediate results; Frank Drake conducted the first SETI study in 1960. Drake found only an eerie silence, and ever since we have only heard an eerie silence. Once the technological threshold of exoplanet search was reached, the search immediately discovered its object, but once the technological threshold of SETI was reached, the search revealed nothing. Please understand that, in making this observation, I am in no sense criticizing SETI efforts; I am not saying that SETI is a waste of effort, or a waste of money; I am not saying that SETI is wrongheaded or that it is not a science. On the contrary, I think SETI is interesting and important, and that includes the fact that SETI has found only an eerie silence — this is in itself important and interesting. We have discovered radio silence, except for natural sources. This tells us something about the universe. If there were a truly predatory peer civilization in our region of the Milky Way, it would be expected that they would go to the trouble to broadcast their presence to the universe, in hope of luring unsuspecting peer civilizations. Like Odysseus having himself strapped to the mast of his ship so that he could hear the song of the Sirens while his crew rowed on oblivious, their ears stopped with wax, we would have to listen to such signals restraining ourselves from rushing toward that fatal lure. Don’t expect to find anything like this close to home. What we now know, as a result of SETI’s discovery of the eerie silence, is that METI (messaging extraterrestrial intelligence) beacons are not common. If METI beacons were common in the Milky Way, we would have heard them by now. There may yet be METI beacons, but they are not the first thing that you hear when you begin a SETI program (unlike looking for exoplanets and finding them as soon as you have the capability of looking). If METI beacons exist, they are rare and difficult to find. I think we can go further than this, and assert with some degree of confidence that there is no alien “super-civilization” in our galactic neighborhood constructing vast mega-engineering projects and pumping out high-power EM spectrum emissions that would be easily detectable by any technological civilization that suddenly had the idea to begin listening for such signals. James Benford has argued that METI beacons entail prohibitive expense, and has argued against unregulated terrestrial METI efforts. If METI is “shouting to the galaxy” (as James Benford put it), then the unintentional leakage of EM spectrum radiation of industrial-technological civilization is not shouting to the galaxy but rather whispering to the cosmos, and in order to be able to hear a whisper we must listen intently — holding our breath and putting a hand to our ear. 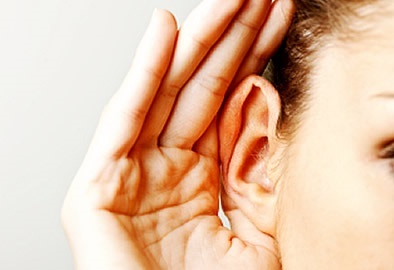 Whether or not we choose to listen intently for whispers from the cosmos, we have not yet reached the developmental stage of civilization in which this is practical, though we seem to be moving in that direction. If we should continue the trajectory of our technological development — which, as I see it, entails both increasing automation and routine travel between Earth and space — such an effort will be within our grasp within the coming century. Advanced industrial-technological civilizations will, by definition, know much more than we know. Their science will be commensurate with their technology and their engineering, since their civilization, if it is an industrial-technological peer civilization (and in so far as industrial-technological civilization is defined by the STEM cycle, which I believe to be the case), will experience the advance of science joined inseparably to the advance of technology and engineering. What would they do with this epistemic advantage? Such an epistemic advantage presents the possibility of SETI and METI asymmetry. We have an asymmetrical advantage over civilizations at an earlier stage of development, as older industrial-technological civilizations would have an asymmetrical advantage over us, with the ability to find us while concealing themselves. A Pythagorean geoglyph based on Gauss’ idea for signaling to ETI. The developmental direction of industrial-technological civilization as defined by the STEM cycle means that any advanced industrial-technological civilization will be “backward compatible” with earlier forms of technological communication. We might not (yet) be able to build a quantum entanglement transmitter in order to communicate instantaneously over cosmic distances (even though we can conceive the possibility), but an advanced peer civilization will be able to listen for our EM spectrum radiation leakage, in the same way that we today could continue to look for signs of ETI compatible with earlier stages of industrial-technological civilization. Karl Friedrich Gauss suggested geometrical shapes laid out in wheat in the wastes of Siberia to get the attention of extraterrestrials, while Joseph von Littrow suggested trenches filled with burning oil in the Sahara. Interesting in this context, although our civilization had the technology to pursue these methods, no one undertook them on a large scale. When, in the future, we have the ability to image the surface of exoplanets with large extraterrestrial telescopes, we could look for such attempted signals within the capability of less developed civilizations to produce, such as those suggested by Gauss and Littrow. But when it comes to advanced peer civilizations, we don’t have the knowledge to know what to look for. The more advanced the civilization, the farther it lies beyond our civilizational zone of proximal development (ZPD), but the more advanced a civilization the earlier it would have to have its origins in the history of the universe, and at some point in the development of the universe (going backward in time to the origins of the universe) it would not be possible for an industrial-technological civilization to emerge because if we go far enough back in time, the elements necessary to an industrial-technological civilization do not yet exist. So there seems to be a window of development in the history of the universe for the emergence of industrial-technological civilizations. This strikes me as a non-anthropocentric way of expressing one formulation of the anthropic cosmological principle (and an idea worth developing further, since I have been searching for a formulation of the anthropic cosmological principle worthy of the name). In an optimistic assessment of our place in the universe, we could hope that any substantially more advanced civilization could serve as the “more knowledgeable other” (MKO) that would facilitate our progress through the civilizational zone of proximal development. After this Andreas Hein launched into a sober assessment of technologies necessary to interstellar flight in “Project Hyperion: Disruptive Technologies for Manned Interstellar Travel”. 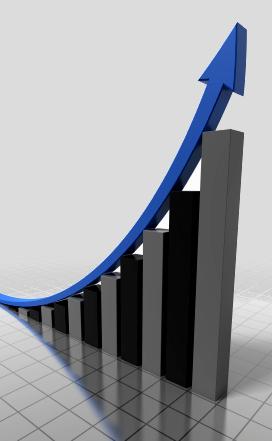 Much of what Mr. Hein presented were ideas that I had independently worked out for myself, describing the S-curve of technological maturity and how technological succession can extend this S-curve upward. Using these analytical tools, Hein assessed which technologies would be necessary to any interstellar mission, and which technologies might prove to be disruptive breakthroughs that rendered other technologies obsolete, ending with the suggestion that investments in technologies must be balanced across a spectrum of low risk/high probability of use and high risk/high gain technologies. Next came Aaron Cardon, a doctor, with “Ideal Biological Characteristics for Long-Duration Manned Space Travel.” This presentation was much more interesting to me than I expected it to be, and suggested to me that designs of a long term interstellar mission would not be uniformly good or bad for human health, but rather that some starship design parameters may compromise human physiology while others may actually optimize human physiology. For example, Dr. Cardon stated that the circadian rhythm of the human body, if taken out of the context of our 24 hour rotation of the Earth may be closer to 26 or 28 hours, which an artificial environment could easily accommodate. Dr. Cardon also spoke about some of the psychological and sociological consequences of long-term missions — something covered in yesterday’s Odyssey presentation — including the dramatic shift that would need to take place in making the transition from an open frontier to prioritizing social cohesion, and how human intuitive heuristics may pose a risk in artificial environments. This talk gave me much to think about. Rob Swinney gave an update of Project Icarus, which was the seed from which Icarus Interstellar originally grew, and discussed a number of design parameters of the starship project that is, essentially, the successor to the Daedalus project. This was followed by a presentation that was not on the program, Robert Kennedy on “Dyson Dots: Geoengineering is the Killer App.” Mr. Kennedy demonstrated how the interests of those seeking to mitigate anthropogenic climate change coincide with those seeking space industry, since space-based geoengineering could both address climate change and result in space industry. Specifically, we could construct a “Dyson dot” between the Earth and sun that would cast ever so slight a shadow on the Earth, marginally lowering terrestrial insolation. Moreover, the sun side of this Dyson dot could be covered in photovoltaic cells, which could generate a significant amount of electricity. Mr. Kennedy rightly noted that this approach is both scalable and reversible, which are real virtues in this context. Jim Benford then presented, “Shouting to the Cosmos: The METI Debate” — METI being Messaging Extra Terrestrial Intelligence, in contradistinction to SETI or the Search for Extra Terrestrial Intelligence. Benford represented that school of thought that feels messaging ought to be discussed before it is undertaken on any great scale, and he contrasted this to the views of some in the field who support vigorous efforts to create a “beacon” and to attempt to send messages out into the cosmos. Benford rightly noted that today a wealthy individual could sponsor such a beacon and engage in METI without anyone to stop such activity. He suggested that international consensus, peer-reviewed publication of messaging details, consultation, and perhaps also an enforcement mechanism were in order. Benford laid out the case both for and against METI, which was quite interesting to me. There were several stated assumptions and derivations from this assumptions, but each assumed something fundamental that was formative to the given position. Those in favor of METI believe that interstellar travel is impossible, while those opposed to unregulated METI assert that EM leakage cannot be detected. As it happens, I can’t belong to either camp because I disagree with both assumptions. I think that interstellar travel is possible, and I think that it is pretty clear that the EM radiation leakage (unintended signals) of a peer industrial-technological civilization can be detected. Benford took the trouble to point out contradictions in the position of those advocating unregulated METI, but it seems to me that the glaring contradition in Benford’s position was that he asserted that EM leakage could not be detected, but he openly admitted that an advanced ETI could pretty easily build an antenna large enough and sensitive enough to hear us. The way he gets around this contradiction is something that I have thought about a bit, and I wrote about it last year in The Visibility Presumption. I want to go into this in a little more detail because it is so interesting. Benford asked the rhetorical question of why ETI would be looking in our direction, in all the vastness of the cosmos. This is a rhetorical question so long as one maintains an unproblematic conception of the cosmological principle, but it becomes a live question and not merely rhetorical once the classical cosmological principle is called into question. Benford’s position perfectly exemplified the cosmological principle, i.e., that we occupy no privileged place in the cosmos, therefore there is no reason for ETI to point their antenna in our direction. I will not here dispute the idea of our not occupying a privileged cosmological position (advocates of the anthropic cosmological principle have spent enough time doing this), but there is a very different way to think about this that undermines the assumption of there being no reason for ETI to look in our direction. Any peer civilization (i.e., any civilization like us) is going to be looking for peer civilizations because this intrinsic curiosity, at least in part, defines our civilization. In looking for peer civilizations, any advanced ETI will show at least as much ingenuity as we have shown in the search for ETI, since ingenuity of this kind is another quality that, at least in part, defines our civilization. We are now, at the present level of our technology, less than twenty years from the spectroscopy of exoplanet atmospheres, which could reveal markers of life and civilization. Any advanced peer civilization would have already done this (spectroscopy of exoplanet atmospheres), and they would have done this for the kind of planets that can host peer civilizations — small, rocky planets in the habitable zones of main sequence stars. In other words, ETI would have already by now done the spectroscopy of Earth’s atmosphere, and in so doing they would have focused in on the Earth as a place of great interest, in the exact same way that we would focus on an “Earth twin.” This would mean that they would focus all their best radio antennas on us, just as we could focus intensively on a planet that would likely host life and civilization. It would be relatively easy for an advanced ETI of a peer civilization to build a custom antenna for nothing other than the possibility of detecting our EM leakage, since they had already identified us as a promising target for SETI and perhaps also METI. In the question and answer session following Benford’s talk a new wrinkle in all this appeared. My co-presenter from Day 2, Heath Rezabek, suggested that someone opposed to unregulated METI could broadcast a counter-signal to a METI signal and essentially silence that signal. The possibility of a counter-signal is an idea that can be scaled up, so that it is possible that what Paul Davies calls the “eerie silence” and David Brin has called the “Great Silence” is not something natural, but could be imposed or generated. One metaphor that has been used to explain the eerie or great silence is that no one shouts in a jungle. This is plausible. If the universe is a dangerous place filled with predators, you don’t want to call attention to yourself. But it is just as plausible that everyone is “shushed” in a library as that everyone keeps quiet in a jungle, and therefore it is just as plausible to think of our universe as a library as to think of it as a jungle. And with that discussion I had to leave the 2013 Icarus Interstellar Starship Congress at noon in order to catch my flight back to Portland. 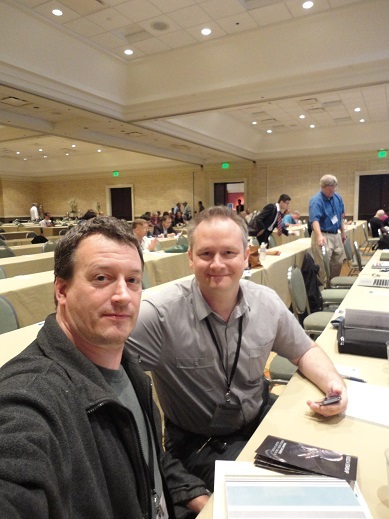 My co-presenter Heath Rezabek and myself on the final day of the Icarus Interstellar Starship Congress. Here is an incomplete schedule for the day’s events (incomplete because Robert Kennedy’s presentation is not mentioned below. Today we celebrate the 540th anniversary of the birth of Nicolaus Copernicus. The great astronomer was born 19 February 1473 in Toruń, now part of Poland. The name of Copernicus belongs with the short list of thinkers who not only changed the direction of civilization, but also the nature and character of Western civilization. Copernicus as the distinction of having a cosmology named in his honor. We would do well to recall how radically our understanding of the world has changed in relatively recent years. Up until the advent of modern science, several ancient traditions of Western civilization had come together in a comfortingly stable picture of the world in which all of Western society was deeply invested. The Aristotelian systematization of Christian theology carried out by Thomas Aquinas was especially influential. Questioning this framework was not welcome. But science was an idea whose time had come, and, as we all know, nothing can stop the progress of an idea whose time had come. Copernicus began questioning this cosmology by putting the sun in the center of the universe; Galileo pointed his telescope into the heavens and showed that the sun has spots, the moon has mountains, and that Jupiter had moons of its own, the center of its own miniature planetary system. Others took up the mantle and went even farther: Tycho Brahe, Johannes Kepler, and eventually Newton and then Einstein. Copernicus was a polymath, but essentially a theoretician. One must wonder if Copernicus ever read William of Ockham, since it was Ockham along with Copernicus who initiated the unraveling of the scholastic synthesis, out of which the modern world would rise like a Phoenix from the ashes of the medieval world. Ockham provided the theoretical justification for the sweeping simplification of cosmology that Copernicus effected; it is not outside the realm of possibility that the later theoretician read the work of the earlier. Today, when our knowledge of cosmology is expanding at breathtaking speed, Copernicus is more relevant than ever. We find ourselves forced to consider and to reconsider the central Copernican idea from every possible angle. The Fermi Paradox and the Great Filter force us to seek new insights into Copernicanism. I quite literally think about Copernicanism every day, making Copernicus a living influence on my thought. As our civilization grows in sophistication, the question “Are we alone?” becomes more and more pressing. Arthur C. Clarke wrote, “Two possibilities exist: either we are alone in the Universe or we are not. Both are equally terrifying.” This insight is profound in its simplicity. Thus we search for peer civilizations and peer life in the universe. That is to say, we look for other civilizations like ours, and for life that resembles us. SETI must be considered a process of elimination, which I take to already have eliminated “near by” exocivilizations, although we cannot rule out the possibility that we currency find ourselves within the “halo” of a vanished cosmological civilization. A peer civilization only slightly advanced over our own (say 100-500 years more industrial development), if it is in fact a peer and not incomprehensibly alien, would also be asking themselves “Are we alone?” They, too, would be equally terrified at being alone in the cosmos or at having another peer civilization present. Because we know that we exist as an industrial-technological civilization, and we know the extent to which we can eliminate peer civilizations in the immediate neighborhood of our own star, we can assume that a more advanced peer civilization would have an even more extensive sphere of SETI elimination. They would home in on us as incredibly interesting, as an exception to the rule of the eerie silence, in the same way that we seek out others like ourselves. That is to say, they would have found us, not least because they would be actively seeking us. So this may be considered an alternative formulation of the Fermi paradox. Despite the growing tally of planets discovered in the habitable zones of stars, including nearby examples at Tau Ceti which lies within our SETI exclusion zone (which excludes only civilizations producing EM spectrum signals), there is no evidence that there are other peer civilizations, and advanced peer civilizations would already have found us — and they would be as excited by discovering us as we would be excited in discovering a peer civilization. There are none close, which we know from the SETI zone of exclusion; we must look further afield. Other peer civilizations would also likely have to look further afield. In looking further afield they would find us. I don’t believe that any of this contradicts the Copernican principle in spirit. I think it is just a matter of random chance that our civilization happens to be the first industrial-technological civilization to emerge in the Milky Way, and possibly also the first in the local cluster of galaxies. We are, after all, an accidental world. However, it will take considerable refinement of this idea to show exactly how the uniqueness of human civilization (if it is in fact locally unique) is consistent with Copernicanism — and this keeps Copernicus in my thoughts. What are the consequences from a cosmological point of view when an industrial-technological civilization comes to an end, whether destroying itself or succumbing to outside forces? What kind of trace will a vanished industrial-technological civilization leave in the universe? An industrial-technological civilization that masters electromagnetic spectrum communications — i.e., ordinary radio and television signals — generates an expanding globe of EM signals as long as it is transmitting these signals. If an industrial-technological civilization that has been transmitting EM signals comes to an end, these signals cease to be generated, and the expanding globe of EM signals tapers off to silence at the interior of this globe, which means that there will be an expanding sphere of weakening EM signals. The thickness of this three-dimensional halo in light years will correspond to the age in years of the now-vanished industrial-technological civilization. If precise measurements of the EM halo were possible, and its exact curvature could be determined, it would be possible to extrapolate the original source of the signal. Once the curvature of the halo has been determined, and therefore also the source, the measurement of the distance from the source to the inner boundary of the halo to the source in light years will yield the number of years that have elapsed since the end of the industrial-technological civilization in question. While such signals would be very faint, and largely lost in the background radio noise of the universe, we cannot discount the possibility that advanced detection technology of the future might reveal such EM structures. The universe might contain these ghostly structures as a sequence of overlapping bubbles of EM radiation that describe the past structure of industrial-technological civilization in the universe. It has been said that astronomy is a form of time travel, and the farther we look from Earth, the farther back we see in time. (This is called “look back time.”) Thus we can think of astronomy as a kind of luminous archaeology. Another way to think of this is that the sky reveals a kind of luminous stratigraphy. The EM halos of vanished civilizations would also admit of a certain stratigraphy, since these halos would possess a definite structure. The outermost stratigraphic layer of an EM halo would likely consist of the simplest kind of high energy radio signals without any kind of subtle modulation of the signal — like Morse code transmitted by radio, rather than vocal modulation. This would be followed, deeper within the EM halo, by analog radio modulation corresponding to spoken language. Next within the EM halo would be analogue television signals, and then digital television signals and data signals of the sort that would be transmitted by the radio link for the internet. This, at least, is the approximate structure of Earth’s expanding EM halo, and if our civilization destroys itself (or is destroyed) in the near future, our EM halo would be approximately 100 light years thick. The longer we last, the thicker our EM halo. An EM halo may drop off as an industrial-technological civilization makes the transition from openly radiated EM signals to the pervasive use of fiber optic cables, but if that civilization begins to expand within its solar system, and possesses numerous settlements in EM contact with each other (as I described in Cyberspace and Outer Space), then the halo will reflect these developments — this is further historical structure layered into the EM stratigraphy of the halo. Given that the structure of a large EM halo would consist mostly of space empty of intelligent EM signals, much of the structure of these halos would be void. It is entirely possible that Earth at present lies within the void of an EM halo that both began and ceased to transmit prior to our ability to detect such signals. In the event of human exploration of the cosmos, as we move outward within a possible void within a halo, it is possible that our first contact with a xenomorphic exocivilization will take the form of encountering the inner boundary of an EM halo, which as we pass through it, will reveal in reverse order the development of that civilization, beginning with its destruction and ending with its emergence. A revised, updated, and expanded version of this post is available at The Halos of Vanished Civilizations: Revised, Updated, and Expanded. A spoken word version of this updated formulation is available at Burst 9 — The Halos of Vanished Civilizations. In The Visibility Presumption I examined some issues in relation to the response to the Fermi paradox by those who claim that a technological singularity would likely overtake any technologically advanced civilization. I don’t see how the technological singularity visited upon an alien species makes them any less visible (in the sense of “visible” relevant to SETI) nor any less likely to be interested in exploration, adventure, or the quest for scientific knowledge — and finding us would constitute a major scientific discovery for some xenobiological species that had matured into a peer industrial-technological civilization. The more I think about the Fermi paradox — and I have been thinking a lot about it lately — and the more I contextualize the Fermi paradox in my own emerging theory of civilization — which is a theory I am attempting to formulate in the purest tradition of Russellian generality so that it is equally applicable to human civilization and to any non-human civilization — the more I have come to think that our civilization is relatively isolated in the cosmos, being perhaps one of the few civilizations, or the only civilization, in the Milky Way, and one among only a handful of civilizations in the local cluster of galaxies or our supercluster. Having an opinion on the Fermi paradox, and even making an attempt to argue for a particular position, does not however relieve one of the intellectual responsibility of exploring all aspects of the paradox. I have also come to think, while reflecting on the Fermi paradox, that the paradox itself has been fruitful in pushing those who care to think about it toward better formulations of the nature and consequences of industrial-technological civilization and of interstellar civilization — whether that of a supposed xenocivilization, or that of ourselves now and in the future. Aristotle as depicted by Raphael in the Vatican stanze. We also speak of a thing’s nature as being exhibited in the process of growth by which its nature is attained. The ‘nature’ in this sense is not like ‘doctoring’, which leads not to the art of doctoring but to health. Doctoring must start from the art, not lead to it. But it is not in this way that nature (in the one sense) is related to nature (in the other). What grows qua growing grows from something into something. Into what then does it grow? Not into that from which it arose but into that to which it tends. The shape then is nature. Aristotle is a systematic philosopher, in which any one doctrine is related to many other doctrines, so that an excerpt really doesn’t do him justice; if the reader cares to, he or she can can look into this more deeply by reading Aristotle and his commentators. But I must say this much in elaboration: the idea of natural teleology is problematic because it suggests a teleological conception of the whole of nature and all of its parts, and ever since Darwin we have understood that many claims to natural teleology are simply the expression of anthropic bias. Still, kittens grow into cats and puppies grow into dogs (if they live to maturity), and it is pointless to deny this. What is important here is to tightly circumscribe the idea of natural teleology so that we don’t throw out the baby with the bathwater. The difficulty comes in distinguishing the baby from the bathwater in which the baby is immersed. Unless we want to end up with the idea of a natural teleology for human beings and the lives they live — this was the “human nature” that Sartre emphatically denied — we must deny final causes to agents, or find some other principle of distinction. Are civilizations a natural kind for which we can posit a natural teleology, i.e., a form or a nature toward which they naturally tend as they grow and develop? My answer to this is ambiguous, but it is a principled ambiguity: yes and no. Yes, because some aspects of civilization are clearly developmental, when an institution is growing toward its fulfillment, while other aspects of civilization are clearly non-developmental and discontinuous. But civilization is so complex a whole that there is no simple way to separate the developmental and the non-developmental aspects of any one given civilization. When we examine high points of civilization like Athens under Pericles or Florence during the Renaissance, we can recognize after the fact the slow build up to these cultural heights, which cannot clearly be distinguished from economic, civil, urban, and military development. The natural teleology of a civilization is the attainment of excellence in its particular mode of being, just as Aristotle said that the great-souled man aims at excellence in his life, but the path to that excellence is as varied as the different lives of individuals and the difference histories of civilizations (Sam Harris might call them distinct peaks on the moral landscape). Now, I don’t regard this brief exposition of the natural teleology of civilization as anything like a definitive formulation, but a definitive formulation of something so complex and subtle would require years of work. I will save this for another time, rather, counting on the reader’s charity (if not indulgence) to grant me the idea that at least in some respects civilizations tend toward fulfilling an apparent telos implicit in its developmental history. Early industrialization often had an incongruous if not surreal character, as in this painting of traditional houses silhouetted again the Madeley Wood Furnaces at Coalbrookdale; the incongruity and surrealism is a function of historical preemption. What I am going to suggest here as another response to the Fermi paradox will sound to some like just another version of the technological singularity response, but I want to try to show that what I am suggesting is a more general conception than that — a potential structural failure of civilization, as it were — and as a more comprehensive concept the technological singularity response to the Fermi paradox can be subsumed under it as a particular instance of civilizational preemption. The more general conception of a response to the silentium universi I call the preemption hypothesis. According to the preemption hypothesis, the ordinary course of development of industrial-technological civilization — which, if extrapolated, would seem to point to a nearly inevitable expansion of that civilization beyond its home planet and eventually across interstellar space as its natural teleology — is preempted by the emergence of a completely different kind of civilization, a radically different kind of civilization, or by post-civilization, so that the expected natural teleology of the preempted civilization is interrupted and never comes to fruition. Thus “the lights go out” for a given alien civilization not because that civilization destroys itself (the Doomsday argument, Solution no. 27 in Webb’s book) and not because it collapses into permanent stagnation or even catastrophic civilizational failure (existential risks outlined by Nick Bostrum), and not because it completes a natural cycle of growth, maturity, decay, and death, but rather because it moves on to the next stage of social institution that lies beyond civilization. In simplest terms, the preemption hypothesis is that industrial-technological civilization, for which the expansion hypothesis holds, is preempted by post-civilization, for which the expansion hypothesis no longer holds. Post-civilization is a social institution derived from civilization but no longer recognizably civilization. The idea of a technological singularity is one kind of potential preemption of industrial-technological civilization, but certainly not the only possible kind of preemption. There are many possible forms of civilizational preemption, and any attempted list of possible preemptions is limited only by our imagination and our parochial conception of civilization, the latter being informed exclusively by human civilization. It is entirely possible, as another example of preemption, that once a civilization attains a certain degree of technological development, everyone recognizes the pointlessness of the the whole endeavor, all the machines are shut down, and the entire population turns to philosophical contemplation as the only worthy undertaking in life. I have previously argued that civilizations come to maturity in an Axial Age. The Axial Age is a conception due to Karl Jaspers, but I have suggested a generalization that holds for any society that achieves a sufficient degree of development and maturity. What Jaspers postulated for agricultural civilizations, and understood to be a turning point for the world entire, I believe holds for most civilizations, and that each stage in the overall development of civilization may have such a turning point. Also, the history of human civilization reveals an acceleration. Nomadic hunter-gatherer society required hundreds of thousands of years before it matured into a condition capable of producing the great cave paintings of the upper Paleolithic (which I call the Axialization of the Nomadic Paradigm). The agricultural civilizations that superseded Paleolithic societies with the Neolithic Agricultural Revolution required thousands of years to mature to the point of producing what Jaspers called an Axial Age (The Axial Age for Jaspers). Industrial civilization has not yet produced an industrialized axialization (though we may look back someday and understand one to have been achieved in retrospect), but the early modern civilization that seemed to be producing a decisively different way of life than the medieval period that preceded it experienced a catastrophic preemption: it did not come to fulfillment on its own terms. In Modernism without Industrialism I argued that modern civilization was effectively overtaken by the sudden and catastrophic emergence of industrialization, which set civilization on an entirely new course. At each stage of the development of human society the maturation of that society, measured by the ability of that society to give a coherent account of itself in a comprehensive cosmological context (also known as mythology), has come sooner than the last, with the abortive civilization of modernism, Enlightenment, and the scientific revolution derailed and suddenly superseded by a novel and unprecedented development from within civilization. Modernism was preempted by accelerating events, and, specifically, by accelerating technology. It is possible that there are other forms of accelerating development that could derail or preempt that course of development that at present appears to be the natural teleology of industrial-technological civilization. Because the most obvious forms of the preemption hypothesis, in terms of the prospects for civilization most widely discussed today, would include the technological singularity, transhumanism, and The Transcension Hypothesis, and also because of the human ability (probably reinforced by the survival value of optimism) to look on the bright side of things, we may lose sight of equally obvious sub-optimal forms of preemption. Suboptimal forms of civilizational preemption, in which civilization does not pass on to developments of greater complexity more technically difficult achievement, could be separately identified as the dystopian hypothesis. It would likely be the case that neurotically miserable civilization — which we might also call dystopian civilization, or a suboptimal civilization — would be incapable of anything beyond perpetuating its miserable existence from one day to the next. The dystopian hypothesis could be assimilated to solution no. 23 in Webb’s book, “They have no desire to communicate,” but there many be many reasons that a civilization lacks a desire to communicate over interstellar distances with other civilizations, so I think that the dystopian lack of motivation deserves its own category as a response to the Fermi paradox. Whether or not chronic and severe dystopianism could be considered a post-civilization institution and therefore a preemption of industrial-technological civilization is open to question. I will think about this.